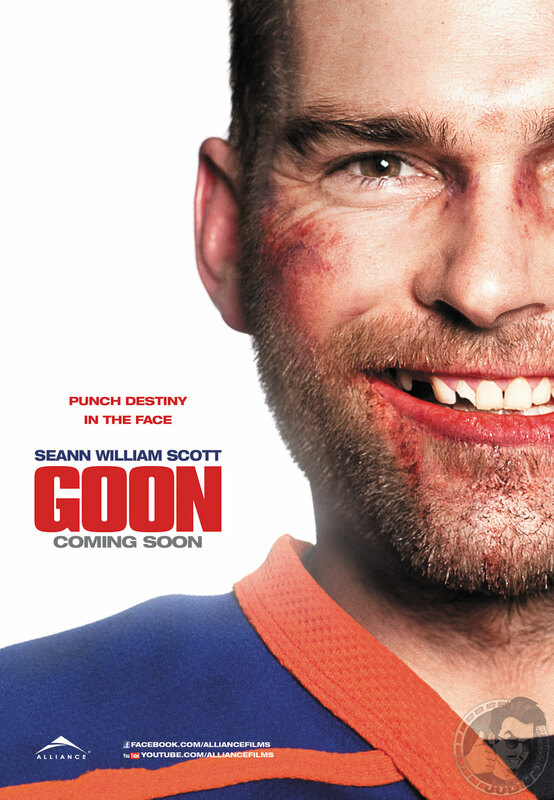 Plot: When Doug Glatt (Sean William Scott) trashes a minor league hockey player at a game, he’s called up to use his fighting skills as a player. Thoughts: To kick off my “Movies I Haven’t Seen” reviews, I asked folks on Facebook to make random recommendations, and Goon walked off with the most support. From this, I can only assume the people on the internet hate me and want me to get brain cancer. The story begins with Doug Glatt (Seann William Scott), a bouncer who gets offered a spot on a minor league hockey team when he beats the crap out of one of their players during a game, despite the fact that he has no discernable talent for hockey and, in fact, does not even appear to know how to ice skate. Overcoming these obstacles, he quickly gets moved up to a farm team for the majors. Aside from having a script where the writer assumes dropping an F-bomb every 14 seconds is an acceptable substitute for characterization, this is where the first major problem with the movie appears. Doug goes to the farm team about 12 minutes into the movie – I know, I looked at the counter and couldn’t believe I’d only been subjected to 12 minutes of this so far. I imagine it’s not unlike Sisyphus reaching the top of his hill and then slipping and watching his stone roll to the bottom. But I digress (because it’s a way to avoid talking about this movie any further). In these twelve minutes, the director and screenwriter do absolutely nothing to make us believe that Doug has any business being in the major leagues. Sure, we see him hit a few people. So what? I’m by no means a hockey expert, but I’ve seen plenty enough of it to know that pretty much any other skill is going to have to be secondary to the ability to properly stand up in a pair of ice skates. The fact that he lasted more than 12 seconds, let alone minutes, it pretty ridiculous. This turns out to be a repeat offense. After spending another 12 minutes on a team where everybody evidently hates each other, Doug meets a girl named Eva (Alison Pill), who he falls for in even less time. She, at least, turns out to be somewhat believable as a character, as she winds up having a secret that makes her seem as unlikable as everybody else in the movie. Then again, the fact that Doug goes along with this makes him less likable in the process. That’s the real problem here, I just don’t buy any of this movie. The characters are all walking stereotypes, with no hint of depth or nuance at all. We’ve got the alcoholic with marital problems, the homophobe, the closeted gay man, and a bunch of people who exist only to be brutally violent and despise one another. Perhaps this is a casting choice. After all, Seann William Scott is usually the perpetually smarmy jerkass in movies. Since here he’s supposed to be the naïve, sweet guy who only gets brutal when he’s angry, perhaps the idea was to surround him by absolutely miserable examples of the human condition to get us to accept him in that role. The amazing thing is that this is, evidently, based on a true story, which means at some point the core nugget of truth probably happened in some form. So how did something that happened in real life transmogrify into something that’s utterly unbelievable? A little more than halfway through, the movie takes a turn for the more downbeat (up until this point it was supposed to be funny). Doug’s temper gets the better of him on the ice, his parents don’t approve of what he’s doing with his life, Eva continues to be an absolutely miserable person, and washed-up veteran Ross Rhea (Liev Schreiber) warns Doug that he’s going to wind up just like him if he keeps going in that direction. Rather than bring him down to a low point from which he can build to redemption, though, the movie just gets more and more miserable, as Doug takes a truly brutal beating, which he then celebrates. The celebration scene, where the entire team is drunk and/or hopped up on prescription painkillers, is one of the most pathetic things ever put on screen. If there’s anything I can say to this movie’s credit, it’s that it manages to avoid the major sports movie cliché of having everything come down to Who Wins the Big Game in the End. Oh, don’t misunderstand, there still is a big game, it’s just that the game itself is largely secondary to what happens between Doug and Rhea, a battle of goons that, like most of this movie, is ultimately pointless. I know this movie has a fan base. What I can’t figure out is why. I am not, at present, working on any Reel to Reel Film Studies. I’ve just been too busy, guys. I’m getting married in a month, it’s the end of the school year, I’m getting married in a month, I’m working on a new book, I’m getting married in a month, and I’m getting married in a month. All of these things, although positive, take time. But I want to get a little more content up here than just the monthly “watched” list and links to movie-related podcasts. So I’m going to try something. Everybody has that list of movies that they want to see, that they should see, or that everybody else thinks they should see. We’ve all had that conversation where we reference a movie and are stunned to discover our friend hasn’t seen it, and we’ve all been on the other end of that conversation, too. About once a week (with a necessary bubble of inactivity surrounding the day I’m marrying Erin), I’ll make an effort to review a movie I’ve never seen before. I have no criteria behind this selection. I’ll choose randomly sometimes, sometimes it’ll just be something I feel like, sometimes it will be a new release, sometimes it might be something that I’ve got in my deep reservoir of DVD boxed sets that include films that — to date — haven’t made it to my eyeballs. I will, however, try to make it at least a little interactive, because if I choose all the movies all by myself, it might start to get kind of homogenous. So from time to time, I’m going to have a little fun and allow you guys to choose, similar to how I had you vote on the terribly infrequent “make me watch a crappy movie” features. But there’s no restriction on quality here. In fact, I would PREFER watching a good movie. NetFlix streaming ONLY. This time, at least. Only feature films, no TV series or miniseries. No documentaries, concert films, or stand-up films. Keep in mind that, although I try to keep my “what I’ve watched” list up to date, there are still movies out there I’ve seen that may not appear on the list. Should one turn up, I’ll veto it. Other than that, I’ll roll with whatever. Peek at NetFlix, decide what you’d like me to cover, and post your selection down in the comments.